My husband, Robert Johnson, is turning 30 on September 25th. Most of you probably know that we are involved with Real LIFE Foundation. Real LIFE Foundation is a Christian, non-profit NGO (non-governmental organization) that envisions seeing thousands of marginalized Filipino youth educated, gainfully employed, and uplifting their communities. It is passionate about providing a better future for underprivileged Filipinos by giving them access to a good education and transforming their environment through community service. Their biggest activities are providing scholarships and weekly feeding programs. On his 30th birthday, Rob wants to give something back to the community through a partnership with Real LIFE Foundation. I want to invite all of you to get involved in Hoop for LIFE. Hoop for LIFE is a charity basketball game. Players include PBA stars such as Kelly Williams, Kerby Raymundo, Asi Taulava, Harvey Carey, Gabe Norwood, and Jimmy Alapag. The roster is still being finalized at this point. All the proceeds of this event will go toward the construction of the foundation’s Real LIFE Community Center in Pasig. Imagine what a blessing it will be for Filipino kids to have a place to go to (other than the streets) in order to play and study! 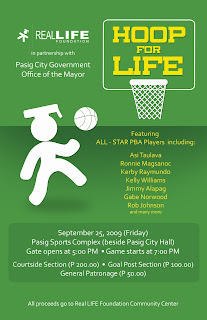 The game is on September 25th, Friday, 6:00 – 9:00pm in Pasig Sports Center – next to Pasig City Hall. I really hope to see you there! Please expect another message from me in a couple of days. I will be letting you know the many ways you can get involved. Thank you for reading this and I look forward to hear from you!